bzimmer.ziclix.com / Melt, limbs, bombs away. And the snow melts and the winter rains return. 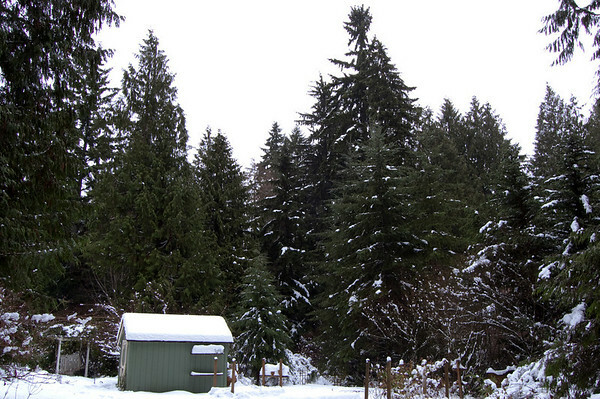 Compare the angle of the limbs of the big trees in this photo with the first photo in the previous post (or mouse-over this photo) — these trees can shoulder a heavy load, until of course they fail and try breaking one of my benches. When we bought our house our realtor said the sellers wished to leave a number of benches if we agreed, to which we did, visions of Smith & Hawken beauty decorating our yard. What we found instead were a random assortment of benches in various stages of decay and, oddly, some 50's diner chairs. We then did what any good landowners would do, we hid them in the woods and forgot about them. 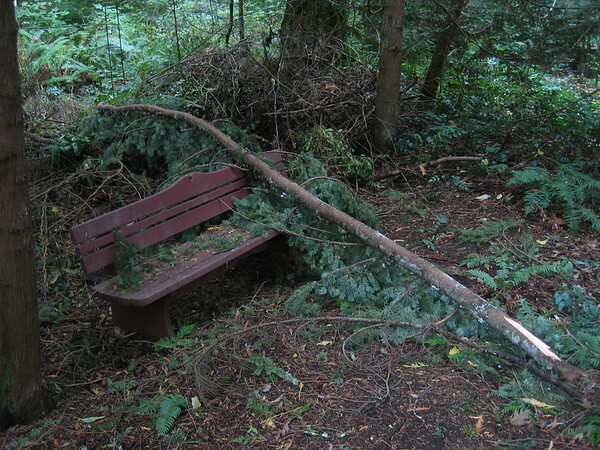 Well, apparently the big trees hate the benches because every time they rifle off a limb it inevitably crashes into a bench. This one came down in the fall during a big wind storm. I was outside in the garden when I saw a limb flying down elsewhere in the yard and came inside "for safety". When I walked the yard later I found the first evidence of my bench-hating trees. 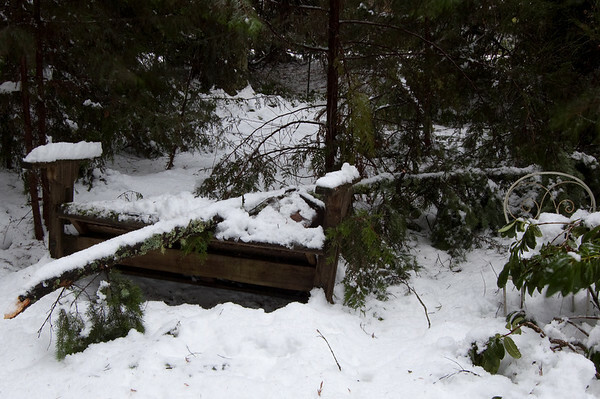 Given the weight of the recent snows I'm not surprised some limbs fell but two-for-two on hitting a bench, and this time crushing it, has me wondering. I heard this one hit the bench from inside the house but I didn't know at the time the thunderous crashing sound was the bench meeting its demise.